Would you like some real expert help on transitioning to ISO 9001:2015? Would you like some real expert help on achieving ISO 9001:2015? 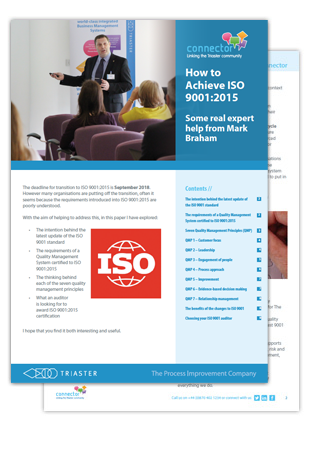 This nine page white paper is written by Mark Braham an expert in ISO 9001:2015, who was heavily involved in its drafting. What are the requirements of a Quality Management System certified to ISO 9001:2015? What are the Seven Quality Management Principles? What is an auditor looking for to award ISO 9001:2015?